Freelance Writer, Field Producer, Aspiring Screenwriter, Paleo Chef, Pantheism Priestess, Actress, Queen of Wands, Mother Nature's Angel, Lover of Bees & Christina Bellantoni's mom. I'm pretty sure that I'm the most cash-strapped person at the red carpet events I attend on a regular basis as a Los Angeles freelance reporter, but I do meet the coolest, most interesting people and once in awhile I even get dinner. Such is the case when I was assigned to Actress/Artist Jane Seymour's lavish "Open Hearts Foundation Inaugural Celebration," which was held at Seymour's beautiful Malibu mansion last month. 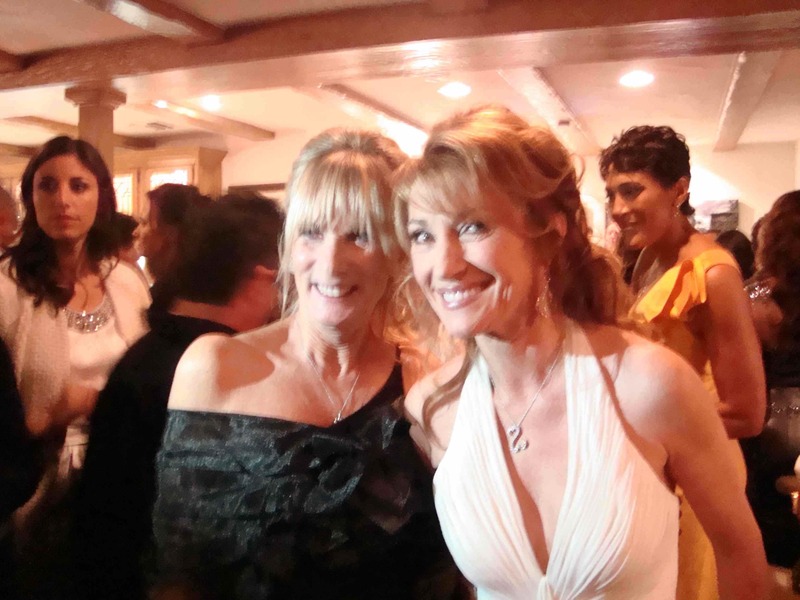 Jane Seymour at the Open Hearts Foundation. Photo Credit: Wire Image Photographer Angela Weis. Open Hearts Foundation is a nonprofit charity that was established in October 2009 by Seymour and her husband, director, producer and writer, James Keach, with the intention to raise funds for children to benefit in the areas of health, arts, sports and education. I knew this was going to be a swanky event and I was told by Seymour's reps that I would have access to the red carpet. I was excited because I've always been a fan of Jane Seymour and several of the other A-listers I knew were attending the event that very cold, stormy Los Angeles evening. Now when I first started doing these types of events I used to dress up, wearing 4" heels and a nice outfit but I discovered standing in one place for five hours with aching feet and freezing my tush off isn't all that glamorous. This was a particularly nasty night weather-wise that included a decent walk down Pacific Coast Highway, so I decided to wear jeans. Who knew I would be the luckiest lady in Malibu that evening? As I was in line checking in during a torrential downpour, a woman suddenly dashed in front of me and said, "I'm not cutting, I'm just trying to get out of the rain." I was genuinely happy to see a friendly face right off the bat and it turned out she was also checking in as "press" but it was clear she had very different access. Long story short, this woman, People Magazine writer, Monica Rizzo, was my lucky charm. Rizzo has my dream job of working for People Magazine so there was no shortage of conversation and I felt an instant kinship. Apparently she did too when she invited me to take her absent husband's place as her "plus one" for the evening, which included a cocktail hour in Jane's home, rubbing elbows with A-list guests, a sit-down dinner, a musical performance and no standing outside in the rain. Again, lucky me! Of course I was thrilled but the jeans I wore were a problem. As I tried to hide myself and my jeans in the corner of the mansion's bar/reception area, Rizzo introduced me to one of the honorees, Susan Rizzo Vincent (no relation), as Seymour, beautiful in a long flowing white gown warmly greeted everyone attending. Photo credit: WireImage Photographer Angela Weiss. Vincent founded the nonprofit organization "Drea's Dream" in memory of her daughter, Andrea Rizzo, who after surviving childhood cancer, was tragically killed at the age of 24 by a drunk driver. Andrea's dream was to become a dance therapist and give children with cancer and disabilities the gift of dance. "Drea's Dream" carries on her wish by raising funds to provide dance therapy to these special children and was one of the four organizations chosen by Open Hearts to be honored that evening. Vincent was so warm, genuine and full of grace as she talked with Rizzo and I about the loss of her daughter, I forgot about my jeans and thought about my own daughter living across country. I marveled at the amount of courage and generosity of spirit Vincent had to turn this tragedy into triumph, helping so many other children instead of self-destructing even during her darkest days. The other honorees also had compelling stories of giving back, which included ABC's Good Morning America anchor and fellow breast cancer survivor, Robin Roberts, who looked absolutely stunning as she chatted with presenter, India Arie. Dallas Cowboy legend, Emmitt Smith and his wife Pat were honored for their charity, "Pat & Emmitt Smith Charities," which provides resources to under-served youth, encouraging the importance of education --And Jesse Billauer, a California surfer who experienced a tragic surfing accident that left him paralyzed. Billauer founded "Life Rolls On," a subsidiary of the Christopher and Dana Reeve Foundation, which is dedicated to improving the quality of life for young people affected by spinal cord injury. The program utilizes action sports as a platform to inspire infinite possibilities despite paralysis. Seymour said in an email to me following the event, the honorees were selected by the Open Hearts Foundation Board because of two factors. One, all honorees have lived their own lives with Open Hearts in some way, shape or form. And two, they have positively affected the lives of children in the areas of health, arts, sports and education. The evening was truly magical for me. Seymour and her husband said they are already planning next year's event which will probably be held in their home. If I get an invite or assigned to the story I'll definitely wear my best dress, I promise. India Arie, Cheryl Burke, Emmitt Smith, Pat Smith, Jane Seymour, Robin Roberts, Susan Rizzo Vincent. Photo credit: WireImage Photographer Angela Weiss.